It's all happening at Naas Racecourse this summer with the announcement of Ladies Day at the Royal Ascot Trial Day as well as the Summer Racing & BBQ. Radio broadcaster Lottie Ryan has just been announced as the fashion judge for this year’s Royal Ascot Trials Day with Naas Racecourse. The Best Dressed Lady’s competition will take place on Sunday, May 19th with prizes fit for a queen worth over €8,500. The lucky lady will win an overnight stay with dinner in the Manor House at Palmerstown House Estate with 19 of her friends, as well as a €1,000 shopping spree in Kildare Village! ‘Breaking the Mould’ is the theme for this year’s fashion competition at Naas Racecourse reflecting the inspirational stories of several Kildare women in sport who have pushed the boundaries of male dominated sports. Pictured is Lottie with Roisin Byrne, Katelynn Phelan, Orla Murtagh and Jessica Harrington. 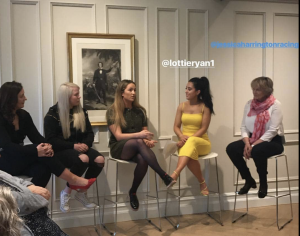 Lottie spoke with a panel of four of Kildare’s most inspirational women in sport, including Kildare GAA football star, Roisin Byrne, the country’s youngest professional boxer Katelynn Phelan, racing industry personality, Orla Murtagh and trainer Jessica Harrington. Admission to the Royal Ascot Trials Day on the 19th of May is €15 per person. Registration for Ladies Day is free of charge with registrations taking place in the Ladies Pavilion located beside the ParadeRing from 1pm-3pm. Also on the cards for Naas Racecourse this summer is the much anticipated Summer Racing & BBQ Season on Wednesday 26th June, which will be headlines by award-winning band Keywest. The Summer BBQ’s are held in our BBQ Pavilion located adjacent to the parade ring. The BBQ Package includes admission to the races, a race card,BBQ meal, reserved table for the day and access to live music from Keywest after racing. For more information visit www.naasracecourse.com. Sign up for all the latest news and events here.